Dinner churches, cowboy churches, farm-to-table gatherings and much, much more. Across the United States, new and alternative ways of congregational life are emerging. As the book’s subtitle suggests, the two found much to admire, Faris said. “Today, the spiritual and congregational landscape in the United States is such that somebody’s got to innovate and take some risks and try to figure out how to make Christian life relatable,” she said. The congregations she and Shapiro studied are doing just that, she said. Although traditional forms of church are still greatly needed, “there are other ways,” Faris said. Shapiro is the president of the Center for Congregations, and Faris, the center’s resource grants director and a resource consultant to congregations. Faris spoke recently with Faith & Leadership about their book. The following is an edited transcript. We spent a little over a year identifying congregations that, at first, we didn’t call “divergent.” We called them “innovative” or “alternative” — people who were doing something unusual and noteworthy in the congregational world but didn’t have a name for it. We also asked people if they knew of any congregations that were doing things that were very nontraditional but still served the function of a congregation for the participants. By that we meant in some way providing spiritual formation, a connection to other people, having some sort of cohesive gathering or sense of identity, but maybe it didn’t look like a traditional church. We ended up finding 12 congregations that ranged from what looked like pretty traditional worship gatherings to gatherings that didn’t look at all like a congregation. But they all had in common what we call “church plus” — church plus something else. One example is Galileo Church in Texas. They meet on Sunday evenings for a worship service that is liturgical. They don’t have a bulletin, but there’s an order of service and hymns and prayers. It’s very handcrafted, with a lot written by their worship team rather than using the denomination’s worship book or hymnal. They’re part of the Disciples of Christ but are very consciously a Christian worship space that is about LGBTQ people and issues. That’s the “plus” part of who they are. Another example is Simple Church in Grafton, Massachusetts. They’re a house church and a dinner church — which, again, isn’t new. They have a liturgy that flows with essentially a potluck meal, so it’s a nontraditional worship experience. But they’ve had to figure out how to be financially sustainable with a membership of 40 people. Because they were so homespun about everything they were doing, and because they are located on a farm, they started incorporating food into everything they do. They made a conscious effort to be a farm-to-table church. Their focus is on the ethics of food and how we eat, and how we eat together. They have homed in on that. But as they baked bread for communion, people noticed that it was exceptionally good. So they started selling it, and now a large portion of their budget comes from selling bread. They’re going to spin off a separate bread-baking business, and they’re moving into pizza making. That doesn’t distract them from being a worshipping community, but it provides a vehicle for generating revenue and income beyond passing the plate. That’s new. And it allows them to engage with their town and their neighbors by selling at a farmers market, and they’ve parlayed that into summer internships for kids in the juvenile correctional system in their area. The “plus” part for them is the bread and the farming. Without it, they would be a dinner church that rents a space. They have incorporated their entire reason for existence into this other, “plus” aspect of what they do. Q: The book says that whatever form these congregations might take, very traditional Christian practices are at their core. Tell us about that. We revisited the work by Craig Dykstra and Dorothy Bass on practice. We did a lot of work on spiritual practices and named quite a few — things like eating together, welcoming the stranger, and music, which we’ve expanded into broader and creative practices. Some of these practices are a natural part of the DNA of the Christian tradition but maybe, over time, have lost the sense of feeling like deeply spiritual practices. Eating together is a simple one to explain. You don’t need a big program about food for eating together to be a spiritual practice, but it does require an intentional awareness of what we’re doing when we sit down together. Welcoming the stranger is another. For cowboy church, the stranger may be the person who’s out at the horse pavilion who happens to smoke, which is verboten, however moderately, in some strains of Christianity. In other divergent congregations, expected cultural norms lose their significance in light of the “church plus” and other key congregational values. In other words, adherence to moralistic cultural norms isn’t the pivot point upon which a person’s welcome depends. Q: What’s the role of innovation in these churches? Built into the word “innovation” is a sense of risk taking. Major companies recognize the need to take risks. They know there will be risk and failure and learning, but it’s in pursuit of some long-term goal — profit or perfecting a craft or something — so the risk is accepted. But in the religion world, we don’t have a place to give permission for risk taking in the way that some of these innovative clergy do. They are willing to take the risk of, for example, being criticized by their denominational counterparts or by others in the Christian world. I respect the heck out of their willingness to take a risk. They’re not getting a whole lot out of it. These aren’t big, fancy places. They don’t have big salaries. Some are sticking around long enough and meeting traditional metrics of success, like people in the seats and dollars in the bank. But it is a conundrum. You can talk about welcoming the stranger, but if you don’t have a viable model to pay for the cowboy pastor, how do you make it happen? In the religion world, that sense of innovation doesn’t happen on such a formalized level. Part of my response to that is, yes, it looks different and it’s innovative. It might even seem kooky, and it may not last. But what they’re doing is deeply rooted in tried-and-true faith practices. Today, the spiritual and congregational landscape in the United States is such that somebody’s got to innovate and take some risks and try to figure out how to make Christian life relatable. Q: The book says that “meaning making” is one the most deeply innovative aspects of these churches but that many congregations today are so focused on surviving, they’ve lost the ability to do that. Speak some to that. My hunch is that for many congregations, everything worked well in a different generation, where institutions matched the social fabric. There was a social capital that matched the world that people experienced in their work and in their social life. That memory gets ingrained and passes from generation to generation but doesn’t get updated. So many congregations get in this pickle where their numbers are dwindling. They’ve got this rich history and a great facility, but they’re in a quagmire about how to stay alive. Even if they have enough money, they may lack vitality or purpose or identity. They can genuinely want to figure it out and be relevant, but it’s hard to dislodge people from an ingrained way of being. You get good at doing what you know. It’s not that it’s bad, but they haven’t found a compelling reason to do something different. Q: What does all this mean for churches, now and in the future? What are the lessons we can learn from divergent churches? First, if the people featured in “Divergent Church” all fold in a few years, I would see that as a natural evolution of humans figuring out the best way to survive. All these people are tinkering around and doing unusual stuff out of a sense of great conviction. Even if [their churches] all die, it is still a necessary part of the organism renewing itself. Somebody’s got to do it. It’s a natural function. Certain cells die off; certain cells get rejuvenated. It’s a natural, basic function. But another part of me thinks that people can learn from these divergent churches to give themselves permission to do something different. If they read about these other people, maybe they will be willing to take a chance and do it too. There is a place for them. There is a growing community of people like the divergent church leaders who are connecting and doing the work. It’s just more subtle than some other expressions of church. Q: At some level, the book is about the question of what constitutes a church. So what does a church look like? What will it look like in the future? There’s still a huge need for a traditional church with a Sunday morning time slot. But there are other ways. We talked in the book about WAYfinding in Indianapolis, which is the farthest from what anybody would identify as a congregation, because they’re so decentralized. WAYfinding is a group that identifies as spiritual seekers. They meet in small groups for eight to 10 weeks on a topic that usually has nothing to do with religion, but the curriculum comes at that topic from a faith or a spiritual point of view. The groups meet all around Indianapolis and come together a couple of times a year for larger gatherings. It’s not a house church, and it’s not like a congregation. It’s not a book club, because they are engaging in some spiritual practices and doing the meaning-making work. There’s not a liturgy, but there is a flow to every meeting that’s more than an agenda. It’s not a worship service, though the gatherings can be seen as worship to some. Are they a congregation? Are they a movement? Are they an alternative gathering for people who want to be spiritual but not religious? I don’t know. People used to be derogatory about the phrase “spiritual but not religious,” but that phrase isn’t going away. It may sound spacey, because it’s not rooted in traditional faith language, but those people aren’t going away. They want community. They want leadership and expertise and opportunity to give and to connect with their spirituality. They’re not going to find it at a megachurch where they can’t get on board with the theology. And they may not find it at a mainline Protestant church where they can’t feel a connection because they didn’t grow up with it or it’s stale or something. 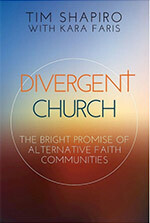 Q: In the book, you say that divergent churches are a summons to the church to loosen up. Yes. Because it’s going to be OK.
We gathered together many of the pastors featured in the book earlier this year. They’re a fun group, which is delightful, but the intellect and theological knowledge and the heart that was present in those gatherings was deeply serious. Some of it is a reaction to some of the moralistic strains of Christianity. Q: What do you admire about these congregations? The hopeful part is that somebody is willing to try. They haven’t given up. They are driven by something outside of themselves to try this unusual thing. That feels really hopeful. Because otherwise, the only options are what currently exist, which are working for many and aren’t working for many others. It also feels hopeful because they’re finding people. They’re finding kindred spirits who resonate with doing church differently, people who are willing to give it a go. Another part that was really interesting is that many of these churches are attached to denominations. I was surprised by how many of them are connected to denominations and are getting substantial denominational support, both financial and otherwise. Q: How can traditional congregations use this book? What’s in it for them? It’s a tough question, because the book isn’t a how-to. But you don’t need to duplicate what they’re doing. Sharing these stories contributes to a greater awareness that other ways are available to express yourself as a person of faith. And if you’re the kind of person who wants to create that sort of space, there are predecessors. You can take heart from what these other people have done. Humans have a very strong need to make meaning, and they’re going to get that need met, one way or the other. It’s not going away. It’s just changing, and somebody’s got to figure it out, which is where I get back to these divergent church leaders. I’m proud of them and admire them, because they’re willing to figure it out in the midst of a lot of ambiguity. There’s no formula, but they’re still trying.